I’ll never forget my poor beleaguered roommate talking with me after he took a risk and told a nice young lady that he liked her. They went on a long walk. He was pretty sure she would reciprocate his declaration of affection. But it turned out she wasn’t interested. She was a sweet girl, a good Christian. She didn’t mean to have bad theology. But instead of just saying “I’m not interested” or “I don’t like you” or “Quit stalking me” or something, she went all spiritual on him. “I’ve been praying a lot about you,” she demurred, “and the Holy Spirit told me no.” “No?” my confused roommate asked. “No… never,” she replied. Poor guy—he got rejected, not only by this sweet girl, but by the Holy Spirit. The third person of the Trinity took a break from pointing people to Jesus to tell this girl not to date my roommate. He has a will of decree which determines all things (DeYoung cites Eph. 1:11; Mat. 10:29; Acts 4:27–28; Ps. 139:16; Isa. 46:9–10). He also has a will of desire which expresses how we ought to live (1 Ths. 4:3; 1 Jn. 2:17; Heb. 13:20–21; Mat. 7:21). To understand how all this works, you may want to pick up the book. I found it quite profitable, and it was an intensely easy read. I fully agree that the way many Christians speak about finding God’s will amounts to a practical denial of the closure of the canon. The Holy Spirit is not going to give me special revelation about whom I should marry. The means for arriving at God’s decretal will for me involves praying for wisdom, examining my situation, applying Scripture (the will of desire) to my situation so that with the best of my ability I by God’s grace make the best choice. 1. Simply doing what is within the explicitly expressed will of desire (Scripture mandates and prohibitions) is not enough. God’s will of desire must be thoughtfully applied to my situation. 2. I confess that what I’m after is not simply the decretal will (which includes even my wrong choices). I want the decretal will to be aligned to God’s will of desire as best applied to my situation. This makes understanding the issue of God’s will(s) more complicated, but I don’t find it helpful to oversimplify the situation. I hasten to add, this doesn’t mean that “finding the will of God” is a complicated thing that I need to be knots about. It does mean that I need to know Scripture well. I need wisdom from God to understand my situation well, and and need wisdom from God to bring those two together to make concrete choices. Book rec: Though it’s been a while since I’ve read it, I recall John Frame having an especially insightful discussion about this topic in his Doctrine of God. Since this is one of the first times in history that I’ve read a particular book before my esteemed former roommate did, this is my first opportunity to say to him: Read the book! 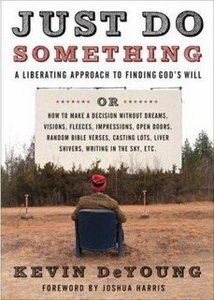 Yes, “Just Do Something” is an unfortunate slogan if it’s divorced from the content of the book. But the book says just what you’re saying, Brian. And it doesn’t say what you’re denying! I even detected, I thought, some Frame in DeYoung’s arguments. I would echo, however, that Frame’s tri-perspectival look at ethics—ethics is a person applying a norm to a situation—would be a helpful lens for people wanting to apply biblical wisdom, including the biblical wisdom available to them in DeYoung’s book. I think the title “Just Do Something” is directed at the many young American Christian adults (especially guys) who, awash in a sea of choices, keep waiting for a clear, extra-biblical sign from God that a given course of action will bring them only pleasure and include no risks. DeYoung is telling them that such a sign is not coming, that they ought to search Scripture, get godly advice, pray, and, well, just do something. I have not read the book, but now I want to. I just thought I would add that my favorite book on this subject (although perhaps it won’t be once I have read DeYoung) is Decisions, Decisions: How (And How Not) to Make Them (by David Swavely). I guess I like it most for its conciseness. Perhaps DeYoung has more theological depth.